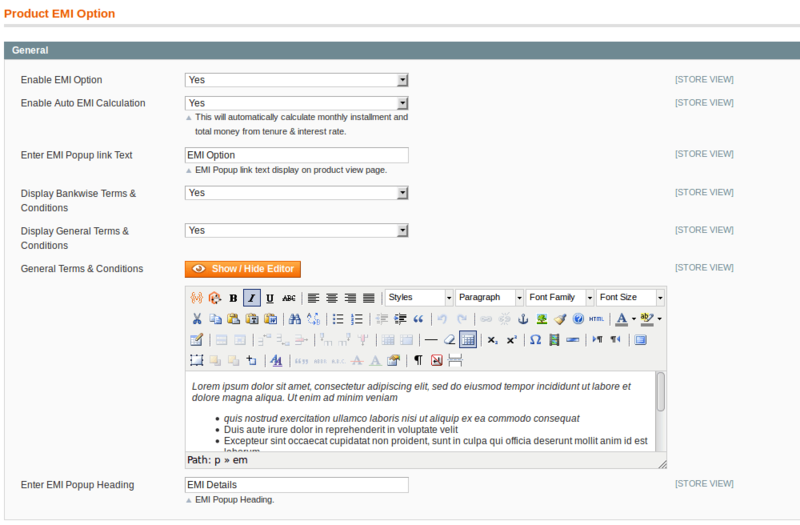 This Magento extension helps store owner to display custom EMI options for the products in Magento. This extension allows store owner to display EMI options like EMI tenure(months), bank interest rate(%), monthly installments and total money with specific banks on the product detail page. 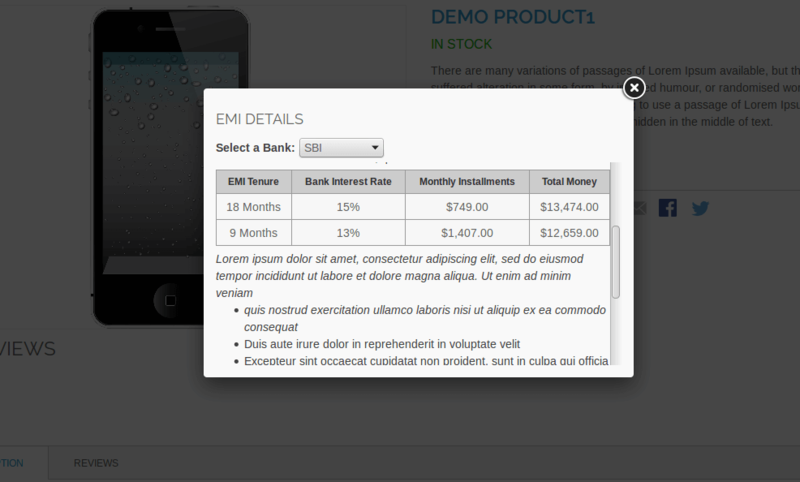 Store owner can set general terms and conditions that will display with EMI table. This extension comes with various configuration options to customize EMI table. Admin can enable this extension from System -> Configuration -> Solwin -> Product EMI Option -> General. Admin can manage all bank details from backend. And also allows admin to add and display terms & conditions for each product from backend. Great extensions, has a lots of good features, and the support at Solwin is the best I’ve ever experienced. I always check their site, before buying any other extension – great people! 1. Go to System -> Configuration -> Solwin -> Product EMI Option -> General and set Enable EMI option to Yes. 2. Go to Catalog -> Manage Products then add/edit any product and select EMI option tab and enter EMI details like Bank, EMI tenure, Interest Rate, Monthly installments. 3. ClickConfigure your settings from System -> Configuration for EMI and save settings. 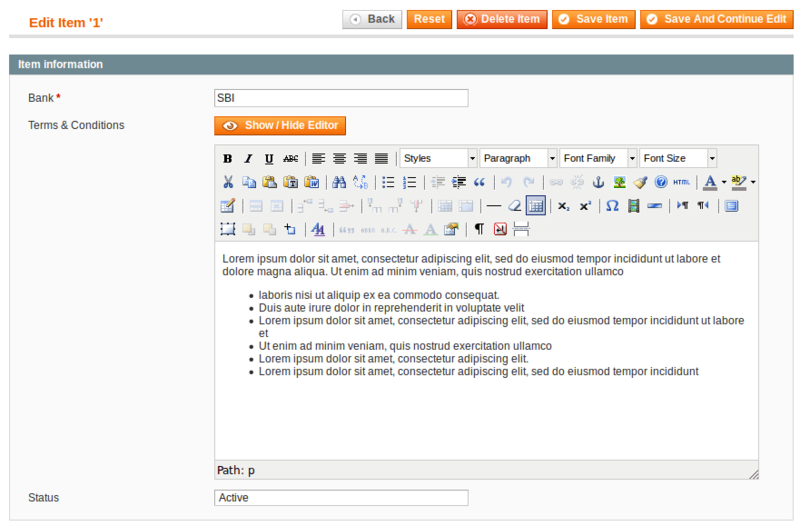 Attribute Tooltip and Image Magento extension will add custom tooltip to your Magento website. This Magento extension provides a capability for Admin to manage attribute option status. This extension for Magento will allow the administration to enable or disable the Maintenance mode for the store.